Interested in Open Data, Open Gov & Open Innovation? Please join me on Twitter! Share your thoughts and interests. The BBC has big ambitions in the Middle East. Following on its launch of BBC Arabic last year, the BBC plans to be a major producer of original Arabic content. Creating market-specific content will require new partnerships with local production, media services and marketing firms. In other worlds, big opportunities for local media companies in major Arabic markets. Big Media expects big business in the Middle East media market. Social networks can make you fat and happy. That's not an opinion, that's a fact revealed by medical data collected over the past 50 years. Simply put, our friends heavily influence our habits and happiness, from our weight to smoking (and quitting) and our overall joy. All these things have a viral quality to them. You eat more, they eat more. You stop smoking, they are more likely to quit. 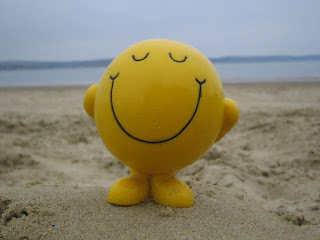 Happiness is similarly contagious. This image shows the Framingham social network, mapping the people of Framingham, Mass. in 2000. 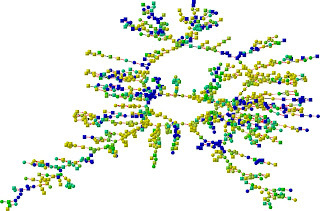 A quick look makes clear that sadness (blue nodes) and happiness (yellow) tend to cluster and spread together. And the technology that powers online social networks does not change the basic dynamics common to all social networks. It turns out that Facebook operates like most other social networks. It transmits the happiness virus just as well. ... allows you to map the possible flooding that global warming may bring to your home if sea levels rise. You can see any place in the world. 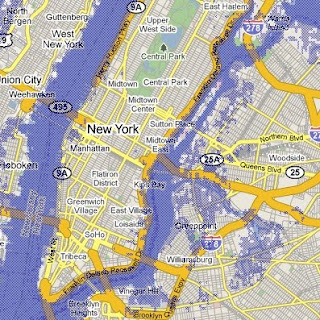 Here is a view of New York City if sea levels rise 2 meters from current levels. 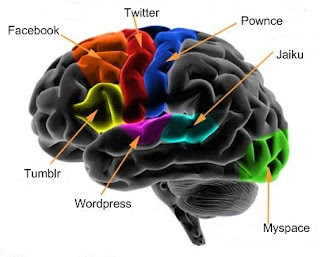 The science of social media is starting to attract attention. At least one scientist is investigating the effects on working memory of using Facebook vs. Twitter. His conclusion (oversimplified) is: Facebook makes you smarter. Twitter makes you dumber. More specifically, Twitter requires less mental processing and fewer synapses firing. And reduces attention span ... as if people these days didn't already suffer enough from this problem. Originator of the phrase Web 2.0, Tim O’Reilly seeks to breathe new life and purpose into the phrase Gov 2.0. His mantra …Gov 2.0: It’s All About The Platform. As Tim emphasizes, innovative new platforms are game-changers – for companies, economies, all of us. Think how interstate highways, personal computers, the Internet, GPS, even the iPhone each transformed society. Each was a new platform for commerce and people to use. Today, new technologies are helping redefine what governments as a platform can accomplish. 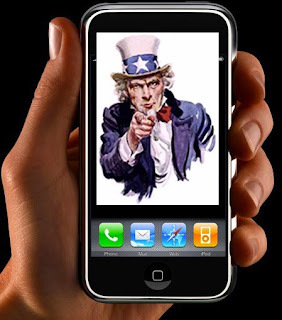 Gov 2.0 means more than simply government use of social media. Absolutely right. However, let us not lose sight of the whole purpose of Gov 2.0. It is not all about the platform. The platform has a purpose: real-time public service. What makes Gov 2.0 enormously transformative is that government, powered by new technologies, is more than a platform; it is a catalyst for innovations in real-time, public service. Government offers not only a scalable operating system for services, but also adds raw data, standards, APIs, apps, even investment dollars in some cases. Gov 2.0 is an open ecosystem in which anyone — a start-up, an agency, an entrepreneurial individual — can invent, enhance or crowdsource a service aimed at the public, or some segment of it. Government becomes one delivery channel among many. 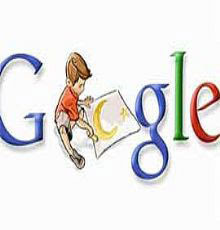 Not to be outdone by recent moves from Yahoo and News Corp, Google is getting busy in the Middle East market. Google already dominates search among Arab-speaking users. Now it is making a serious play in Arabic digital content. Its release of Google Sites in Arabic and four new Arabic editions of Google News (for Egypt, Lebanon, UAE and Saudi Arabia) represent a smart effort to expand beyond search into content. Offering a free, Arabic version of Google Sites is designed to make customized website creation in Arabic a simple process with (of course) searchable results. Google powering Arabic content creation, pure and simple. 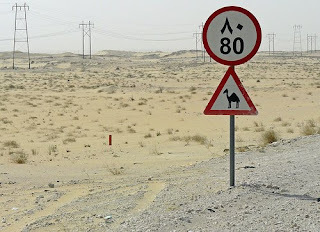 Arab publishers, especially regional newspapers, will need to speed up efforts to build strong news sites (and aggregators) and online brands, or risk permanently losing their readers to local Google News in Arabic. Through search, Google is already the main gateway for most users to reach news sites. Middle East publishers will completely lose control over how their audience reaches them if Google News in Arabic succeeds, if they fail to build a direct relationship with their online readers. Google moves in apps and news pale in comparison to the dollars and headlines of this week’s big investments of Yahoo and News Corp.
Google is already the #1 site among Internet users in Saudi Arabia, Egypt, UAE, Jordan, Kuwait and Qatar. If Google is able to penetrate both the Arabic content creation and news spaces, it will have a formidable position in the Middle East before the online market truly reaches its growth potential. And it will have outflanked Yahoo, News Corp and all other comers. Quick Hit: Google may also be planning an expansion in Jordan, perhaps even siting their regional IT hub there. The Middle East is hot, and global media companies are keen to grab a piece of its rapidly growing media market. Fast on the heels of Yahoo's acquisition of Maktoob.com, News Corp is seeking a 20% stake in Rotana Media, a Saudi-based media and entertainment giant, reports the Wall Street Journal. This is the second major Middle East media deal in one week. But in many ways, it is no surprise. Kingdom Holding Company, controlled by Saudi Prince Al-Waleed bin Talal and owner of Rotana, already owns 5.7% of News Corp. Rotana broadcasts two Fox-branded channels (Fox Movies and Fox Series) in Saudi Arabia. Last year, James Murdoch made a high-profile visit the Gulf exploring partnerships with major Middle East media firms. His trip included meetings with Prince Al-Waleed to discuss future collaborations. Now we see the fruit of those meetings. News Corp's first big Middle East investment. While Yahoo's tie-up with Maktoob.com was a purely digital play, Rotana's media assets include a TV network, a library of over 2,000 Arab movie titles, a production company, record label, music channel, and hotel chain. First Yahoo, now News Corp. There will be more deals to come as Big Media identifies other opportunities in this young, booming Middle East market. MySpace … the Next AOL? MySpace is looking like the first AOL of the 21st Century. And not in a good way. 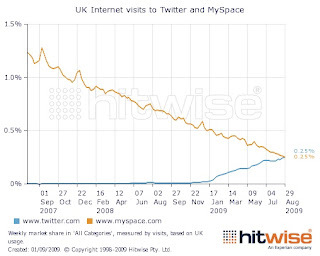 TechCrunch noted that Twitter has overtaken MySpace in traffic in the UK. That day is surely nearing in the US and globally. The question: Is an AOL-like decline inevitable for MySpace? One data point suggests that MySpace’s downturn is not only relative. 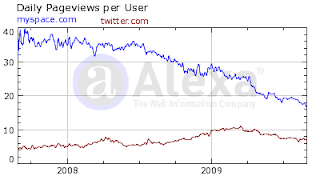 Daily pageviews per user has dropped by 50% for MySpace over the past 2 years. It is steadily losing the competition for eyeballs. Obviously, the rise of both Facebook and Twitter has been at the expense of MySpace, still the second largest social network in the world. But MySpace is heavily dependent on US users and traffic. Facebook has successfully broadened beyond the US, which now accounts for only 31% of Facebook’s user base. Twitter draws 59% of its traffic from outside the US. For MySpace, 65% of its users still come from the US. And it’s been around for years. That is a recipe for stagnation. Twitter and Facebook have room to grow, as uptake rises in other countries. Unless MySpace identifies some new, compelling services or finds a way to grow its brand globally, it looks like a contender for the next AOL.